Egypt's President Abdel-Fattah El-Sisi has called for implementation of programmes to achieve integration without obstacles between Arab and African nations. 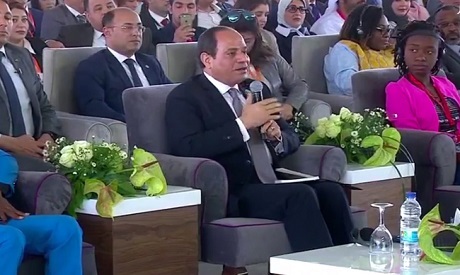 The president was speaking at the Arab and African Youth Forum in Aswan during a session entitled “Nile Valley: The Pathway for Arab and African Integration." He said that Egypt is always ready to cooperate with all Arab and African countries, and not only with its brotherly neighbour Sudan. He also said that African and Egyptian youth, with the potential, willpower and perseverance given to them by God, can present themselves very well in any country they travel to. He praised the historical ties between Arab and African nations, which were demonstrated by multiple summits held over the past 40 years, he said. El-Sisi said that the dream of Arab-African integration is not new, adding that the founding fathers of the African Union had always hoped to make it come true. He also warned of the negative impacts of social media on regional stability. "Before we talk about Arab-African integration, we must be aware of threats to the stability of our countries,'' he said, underscoring the important role played by political leaders and media officials to spread awareness among citizens about the challenges threatening their countries. El-Sisi said that empowerment of women and youth should be generated by political leadership that can transfer it from desire to reality. "Any business or capital owner seeks stability in the country he is willing to invest in," the Egyptian president commented. "Safety and stability is a great opportunity we shouldn't lose," he added. El-Sisi was briefed on the activities of a number of youth entrepreneurs in Egypt during the session, as well as recent efforts exerted by banks and financial institutions to achieve financial inclusion, develop payment systems and maximise funding for small- and medium-scale projects. During the session, Heba El-Bashbishi, a specialist in African affairs, thanked El-Sisi for his intensive efforts to restore Egypt's strong role on the continent. El-Bashbishi said that the challenges facing Africa and the Arab world are enormous, including terrorism. The Egyptian president also discussed the presidential programme for grooming young people for leadership, saying it was motivated by a strong belief in their capabilities and qualifications, and said he wished Egypt could provide more scholarships to Arab and African brothers. The president’s spokesman, Bassam Rady, said in a statement on Sunday that the president had also inspected the economic pavilion on the fringes of the youth event. The three-day youth event began on Saturday.